"This is very rich and creamy. Probably the best cheesecake that I have ever eaten. This recipe actually tastes incredible with any flavor of jam!!" In a large bowl combine cream cheese, sugar, eggs, and vanilla. Beat until light and fluffy. Pour batter into graham cracker pie crust. Bake in the preheated oven for 25 minutes. Allow to cool completely. For the topping: In a medium bowl, fold the raspberry jam into the whipped topping. Spread over top of cooled cheesecake and refrigerate for approximately 2 hours. This was pretty good! 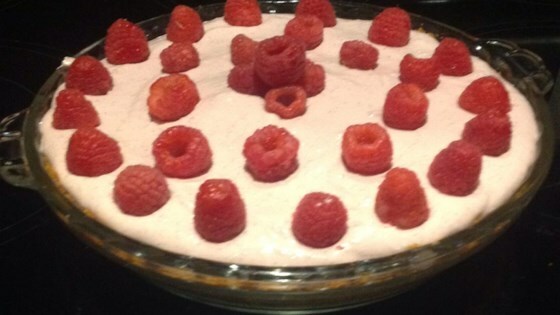 I added a cup of melted chocolate to the cream cheese mixture and made a raspberry chocolate cheesecake--YUM! I just made this for a ladies tea and it was a huge success. I used a small 8" springform pan and used one package of neufchatel cheese instead of 2 full-leaded. Loved it! This cheesecake was okay. The cheesecake part was not sweet enough, and the raspberry mousse on top was a little lacking, too. I would not make this again. Easy; great; impressive; I made it with real whipped cream and it was wonderful.